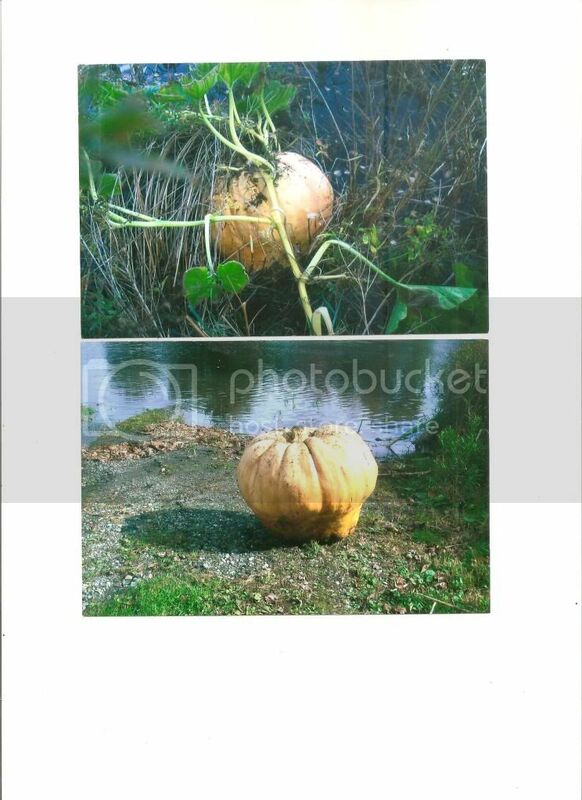 You can go to Amazon an order one of Don Langevin's books on growing giant pumpkins. The info in the book can be applied to any pumpkin not just giants. One year a vine from an Atlantic Giant grew out into the lake and I found this gowing in a foot of water. Love the pics and information Johnny123 amazed it didn't rot sitting in the water. Any experiance with this seed? The add said up to 200 with this being my first attempt what might i expect in reality? They are very heavy feeders. You should be able to get a 100+ lbs pumpkin without too much work. Get some Pumpkin Pro for the roots. If you use a feeder with a hose to fertilize and water try to keep the leaves dry. a 100 + would be great.. I have only found 10 10 10 and 13 13 13 though. Check some water soluble Miracle-Gro Nursery Select. I will check on monday when I head to town for the MG nursery select. Just got my truck running today after a week with out it so I am ready to head to town..
and 28 regular pumpkins to start. I had a fast question before I start. Does the orientation of the seed matter when I place it in the starting media? I started mine in plastic baggies and on paper towels. I get plenty of germination from them and didn't have to do anything fancy! Although, i have big max's i was trying to start as well and none of them really germinated. The regular pumpkins, however, did nuts! And, yes, point down since that is where the roots come out from- i would leave the rounded tip sticking up out of the soil though. Would also (personally) recommend not using the miracle gro stuff on any plants, though. I used it last year and they got all busy, but never really produced anything. You will probably see them up in 10 days depending on the soil temp. I water and cover with plastic wrap until they are up. Interesting thread, guys! I always wondered which end of the seed should go up and which should go down. I like the bit about filing off the point, too. Good stuff! Ok we are now counting down days till sprouts I guess. I will make sure they stay moist and they are indoors so the lowest the soil temp should get is 68 and the day time around 75 to 80 depending on weather and how much the lights heat things Up. If the soil is not 75 to 80 degrees it will be awhile. This is soil temp not air temp. Dig up a few seeds. The root should just be getting started. Look for a tiny white root at the pointed end of the seed. How To Dry Pumpkin Seeds?